The Venice White Wooden Chandelier with a distressed look is a lovely, rustic piece. Its neutral white color palette makes it an easy statement piece to incorporate into your home. The wooden orb shape features graceful curves that enclose the cluster of bulbs which release a warm and welcoming light. 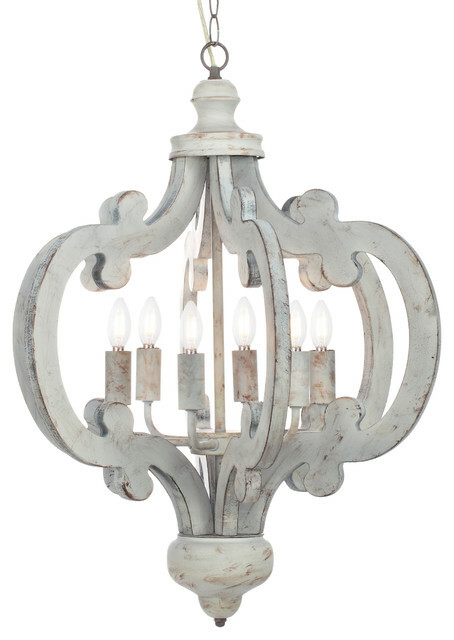 Bring farmhouse style with a touch of glamour to your home with this lamp from 1st Avenue. Ceiling rose dimensions: 5" x 5" x 2.5"
W 20.28" / D 20.28" / H 23.39" / 8.82 lb.